Despair like fear is routed in a lie. But when your feeling it, it’s sure hard to remember this. That’s why, just like our body’s and mind, our spirit must be strengthened through practicing Gods presence and exercising our faith. For if you remain silent, I will be like those who go down to the pit. The psalm then turns from despair to joy (vv. 6–9). This shift in David’s emotional journey is raw, heartfelt, anguished—and full of faith. The psalms are emotionally honest, but they never wallow in self-centeredness. Despite his feelings, David still knows God to be his strength, shield, and shepherd. 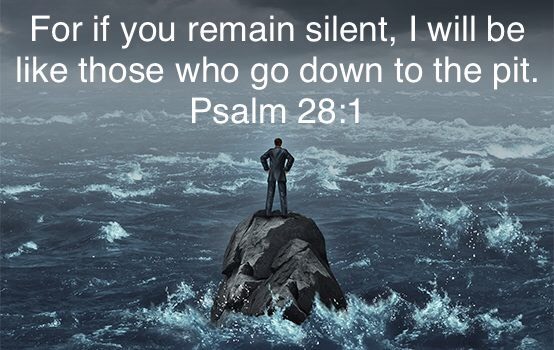 Though He seems silent now, He is a God who hears, speaks, saves, and blesses, and He will be true to His character. Praise the LORD! For he has heard my cry for mercy. The LORD is my strength and shield. I trust him with all my heart. He helps me, and my heart is filled with joy. I burst out in songs of thanksgiving. The LORD gives his people strength. He is a safe fortress for his anointed king. Save your people! Bless Israel, your special possession. Lead them like a shepherd, and carry them in your arms forever. This entry was posted on June 8, 2018 at 6:24 am and is filed under One Walk. You can follow any responses to this entry through the RSS 2.0 feed. You can leave a response, or trackback from your own site.